Vegetarian option on the left, omnivore option on the right. One of the ways I show my love for my family is by cooking for them. I'm not alone in this! I consider myself fortunate that I also like to cook and am curious about new foods/new recipes, but even if I were just making the same seven staple dinners each week I'd be putting love into each meal. 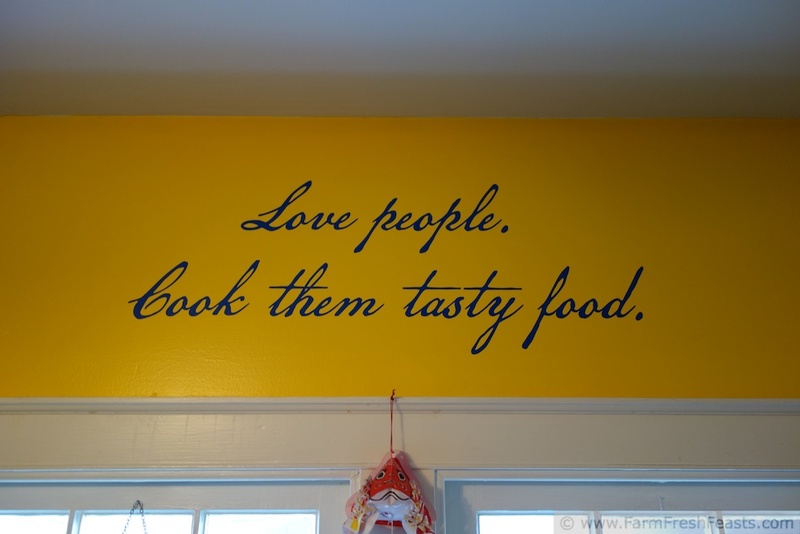 In fact, when we moved into our home <and I had a Groupon to use> I had the Penzey's Spices slogan made into a wall decal over my kitchen window. My kids think the font I chose is a bit wonky, and run around saying "Book them tasty food!" Little darlings. I meet more and more folks who live with, and love, people with different dietary habits. My friend Lorin at the VeganAsana, wrote an excellent post on this topic. If you are a vegetarian cooking meat for a carnivore--that action shows your love and respect. If you are a carnivore choosing the vegan buttery spread while doing the family grocery shopping--that action shows your love and respect. Sitting down to a meal together, a meal that contains a variety of dishes that can work with everyone's dietary choices, sounds simple but really is an expression of love and acceptance of those you love. Even though I feed a house of omnivores, this pizza is an expression of my love for anyone reading who lives with and cooks for those with different dietary habits. Like with the bus stop method of home schooling, this is the bus stop method of cooking. You can stop the pizza where it suits you or your family's dietary habits. This pizza works for vegans, vegetarians, or beet-curious carnivores. A mere 1/2 cup of finely shredded beets turns the dough shockingly pink. I like it. 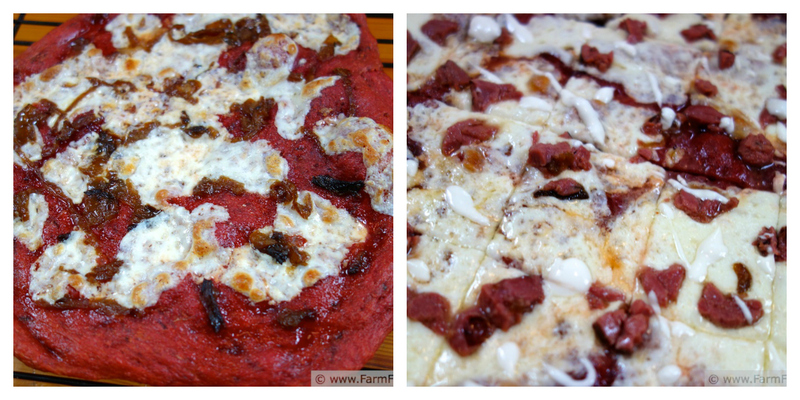 I freely admit that I made the beet crust purely so I could blog about it. [Having shredded beets put up in the freezer played no small part either.] I was was thinking it would be something neat for Valentine's day. Then I remembered the taste of the Beet and Horseradish muffins that will appear on this blog on a future Muffin Monday. Having had those muffins, I know that my mom was right and beets pair well with horseradish. Horseradish, in turn, pairs well with roast beef. So it wasn't a big jump to get a Roast Beef on a Beet Crust Pizza drizzled with Horseradish Cream. The trickier bit was the flavors in the middle, and I am grateful to the males in my household for that. My spouse and son kept asking for another pizza with fresh mozzarella, and on the drive home from sled hockey practice one night my son and I created the layers of this pizza. In our heads, at least. Now that I know to keep an eye out for the upcoming sell-by dates and snap up balls of fresh mozzarella as they are marked down in the fancy cheese area of the grocery store, I am happy to oblige their desire for fresh cheese. Thus far we have a shockingly pink beet crust with bright white discs of cheese, and I thought roasted garlic oil would be an excellent sauce in between those layers. Conveniently, in my fruit and veg freezer, I had a lone packet of caramelized onions next to the roasted garlic so I grabbed that, too. Here's how this shakes out. Yikes. That sounds ambitious. Let's start with the basis of it all--the beet crust. I prefer making my crust a day or three before use--it stretches so nicely when it's not brand spanking new. Vegetarian option: roasted garlic, fresh mozzarella, caramelized onion. The fixings for horseradish cream, and I tossed the roast beef in the leftover caramelized onion 'juice'. Omnivore option: with and without the horseradish cream drizzle. Must work on drizzling skills. When you're ready to bake, preheat the oven to 450 degrees with a pizza stone--if you have one--in it. 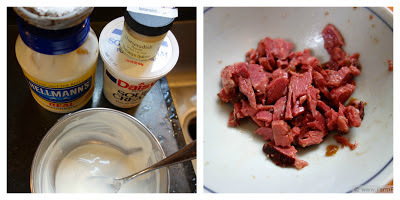 Note: If you're planning on adding roast beef and drizzling horseradish cream over top of your pizza, make the Horseradish Cream now: combine all the ingredients in a small bowl and set it aside for the flavors to blend. In a small bowl, smash the clove of roasted garlic into smithereens and stir in the oil. Set aside. I've always wondered what a smithereen is. On an oiled piece of parchment, stretch out dough into a pretty pink circle or square. Or be really talented and make it into a heart, then share the photo on the FarmFreshFeasts FB page. Spread roasted garlic oil over crust. Here's the first stop on the bus stop method of cooking: if you're feeding the vegans you love, top this crust with caramelized onions and a grind of pepper. Bake as directed below. If you're feeding vegetarians, continue reading. Top the roasted garlic oil with thin discs of fresh mozzarella. Here's the second stop on the bus stop method of cooking: if you're feeding vegetarians you love, top the pizza with caramelized onions and a grind of pepper. Bake as directed below. If you're feeding beet-curious carnivores or omnivores, continue reading. Slide the crust, on parchment, onto the baking stone. Use a cookie sheet if you don't have a stone. Bake for 5-8 minutes, until crust is puffed (and if you have cheese it is oozy). Slide the crust off the parchment and bake directly on the stone or cookie sheet for another 3-5 minutes. Here's the final stop on the bus stop method of cooking: if you're feeding omnivores or beet-curious carnivores, top the pizza with roast beef and drizzle the horseradish cream over top. Return to the oven for a minute or two to heat the top. Cool the pizza on a rack for a few minutes, then slice and serve. This post has joined the Valentine's Day Party at Buns In My Oven, the FarmGirl Blog Fest at Let This Mind Be In You, the Wednesday Fresh Foods Link Up at Gastronomical Sovereignty, at What's in the Box at In Her Chucks, Food On Friday (twice), Taste and Tell Thursdays, and Tasty Tuesdays. Check 'em out! I made this pizza, along with Sweet Corn and Blueberry waffles, for brunch. It's good on Friday nights, too! Beautiful pizza no matter which way you cut it, and thanks for link up. I love coming up with creations on the fly and then actually having those same things work out. I also am loving the color of you kitchen and the lovely quote. Speaking of love...."Yes, desire and other things are important too." How quickly you pass over those "other things." Send them to my blog for that or maybe not, because I might corrupt those young and fragile minds. Would you want to read your mom blogging about "other things"? My kids read my blog! In fact, it was a good thing my son had swallowed his drink when he LOL'd after reading the caption on the quote picture. I love the kitchen walls too (this is the first house I've been able to paint in . . . well decades, so I'm loving color), though when we first painted them I described it as "screaming yellow" not "sunflower" like the chip said. I do need to work on my drizzling skills, somehow. Perhaps if I practice with salted caramel sauce over Graeter's caramel ice cream on top of a DLM Killer brownie . . . There are so many thing I love about this post! The logo on your kitchen wall is great - I have always equated cooking with showing love. Growing up, familiy dinners were the most important part of the day. And my mom is a vegetarian who still cooks for a carnivore every day (my dad - the original meat and potatoes guy!). Love, love, love the valentine's pizza! I can't wait to try this. Your mom sounds like a peach! I'm glad she is able to show her family love and give you good memories of family dinners. Please let me know how your pizza turns out. What a pretty dough! I think my family is not adventurous enough to eat it, but it gives me other ideas...like maybe beet/plain swirl bread with cinnamon...thanks for the inspiration! The crust really isn't too beety (I'm the beet lover in the family, but the rest of them grooved on the cheese and beast and made no complaints about beetyness). Happy to inspire--let me know how it turns out! I'm glad. My kids spoofing the slogan makes me smile! Love that slogan! I don't think my husband would appreciate that on the wall, but he might go for a fridge magnet or a framed version. Your beet dough is such a lovely color! I am the only beet-eater in the family, so thinking that wouldn't go over well here. But love reading about it and love your pics! I totally need to be more adventurous with my pizzas! It's funny, my spouse was fine with the vinyl cling decal on the wall, but didn't want anything in a frame. You never know about your family--I'm the pickled and roasted beet-lover here, but everyone liked the dough. Cheese and beast make up for a lot, I think. Thanks! Nice recipes...and we have the Penzeys slogan bumper sticker on our car! Lucky you! No bumper stickers here, you have to come into my kitchen (or, I suppose, read the blog) to know of my Penzey's love). Now that sounds like fun! I look forward to reading about your Beet Chip adventures. also, i want that wall...or i could just make one like it. DIY, am i right?? I realize you are in Canada, but I know they've got Groupon or something similar here. Sign up, and when you get Groupon for vinyl wall decals (this is from LacyBellaDesigns) use it to get a custom one. Just pick a font that isn't open to interpretation . . .
Wow! I am totally in on the beet crust. And I just got 2 bunches of beets today! Can we pretend that it's clean eating? or better yet, can I pass it off as a one time treat? I'm glad you're doubly in on the beet crust! You're so lucky to live where you get a year 'round CSA delivery. Perhaps our next home will be in a warmer climate. Gorgeous pizza, and such a fun idea! This is so creative and I bet it's delicious as well! Creative, desperate to use beets--you decide! I'll have to make 3 pizzas because all the variations sound delicious! 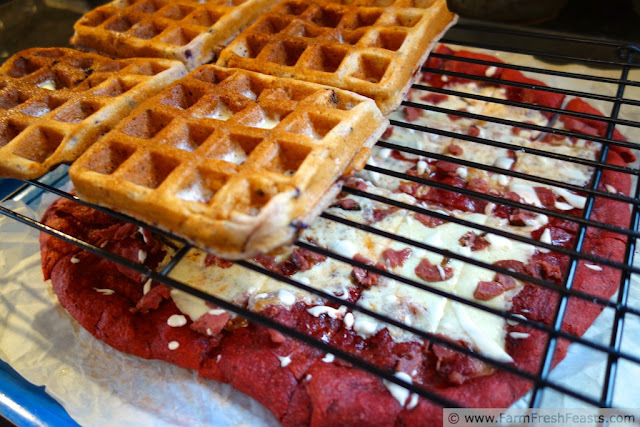 And beet crust…what a cool idea. Can't wait to try it, pinning! Wow, this pizza looks so special. I never knew that beets can be blended and used for pizza. This must be a super healthy pizza and a must try for me. My family loves pizza, so I make it often and try to keep things interesting. Beets make the best colorful foods--even when you don't want them to bleed all over a salad! Thanks for pinning! This is so creative! Love it! And love the beef and horseradish! I grew up eating fancy brunches and special meals at a prime rib place that had the best popovers with horseradish. Yum. I miss that place. You are wise in the ways of life, love and pizza. You know, Penzey's made a bumper sticker out of that saying, and I have it on my fridge! With age comes wisdom. Or something. I've got the Penzey's bumper sticker sitting on a shelf somewhere! My fridge is too filled with kid papers and foolishness. How creative are you!! This looks so interesting, and what a helpful post! !